STATEWIDE — Boat owners have the ability to jump aboard their ship and disappear from society for a while. Some even take it a step further and live an adventure-filled, carefree life as liveaboard tenants. At least, that’s what most might think. As it turns out, in California it is a difficult process to live on a boat. Doing so requires a large amount of planning and could take several years to finally meet the criteria needed to be authorized to hold a liveaboard permit, depending on the harbor or marina one chooses as a home. However, there are some who do not go through the motions of complying with the liveaboard rules in marinas. Enter the sneakaboard tenant, or a person who is living aboard his or her vessel in a marina or harbor without the contractual right to do so. It’s a similar concept to perhaps a squatter in an apartment rental. The word itself suggests a lawbreaker with an especially underhanded, stealthy way of jumping from liveaboard tenancy to tenancy – a possible nuisance for both harbors and other liveaboard tenants alike. A popular website, Reddit, has an entire section dedicated to liveaboard communities all around the world. Most of the users begin threads with inquiring lifestyle questions, but some flat-out ask about the marinas and harbors where they can reside as sneakaboards or under the radar. It is unclear whether there is a rising sneakaboard dilemma in Southern California, but it has certainly been in the news over the years in Northern California as residents, usually younger techie types, look for alternative options to battle increasingly high rental costs. One gentleman, an Irish citizen with an American fiancé, first posted in 2015 with the desire to find a place to live in the San Francisco Bay Area, was an example of such sneakaboard inquiries. Multiple responses came as a result, but the majority advised the man not to break the law. A response to the thread by user docmongre brought into question the management of varying marinas and harbors, asking whether tenants would want to pay to live somewhere that was not well managed or allowed ongoing situations where sneakaboards were allowed to dwell. One of the troubling aspects of sneakaboards, whether they are a pest to other tenants or the marina or not, is that legal tenants pay a premium for electricity, water, garbage, harbor amenities and may follow a strict number of requirements to maintain their permits and keep good standing. Sneakaboard tenants do not accumulate these costs nor are they in compliance with the harbor rules. Most harbors and marinas have a waiting list for boaters who wish to apply for a liveaboard permit. Typically, there is a limit on how many permits and slips are reserved for liveaboard vessels. In Oceanside, where there has been problems reported of illegal tenants for years, there is a limit of 10 percent. In the case of some harbors, such as Dana Point, the percentage allocated by the County of Orange is much less at 3 percent. Doug Whitlock, general manager of Dana Point Marina Company, has been with the company for nearly 40 years and said Dana Point Harbor has made an effort to keep policies easy to understand. Whitlock said the harbor currently has 11 permittees out of 1,428 on offer, making liveaboard tenants less than one percent of the current tenants at Dana Point Harbor. While tenants can easily apply for permits, the waitlist for slips is between two to 15 years for vessels 35 to 65 feet, which is what is required to be an authorized liveaboard tenant at Dana Point Harbor. This may seem like a conundrum, but Whitlock says there is logical reason this might be the case at most marinas and harbors. “The waitlist … prevents folks from becoming liveaboard on a whim. If they don’t have a slip already, they have to plan ahead for a few years to make it happen,” Whitlock told The Log. What qualifies as a liveaboard is also determined by each harbor and marina with some cities being friendlier towards it than others. Contacting the marinas and harbors individually to learn more about slip allowances, rates, permits and regulations is advisable. 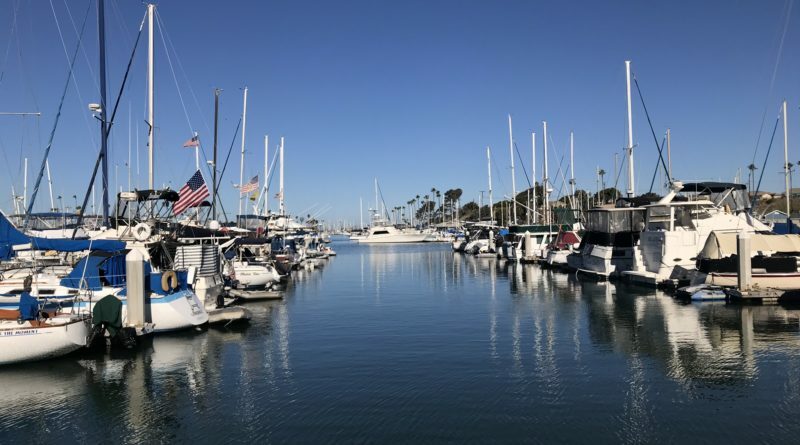 According to Whitlock, unauthorized liveaboards in Dana Point Harbor are a relatively rare occurrence, and the main goal is to bring slip renters into compliance with the policies. Oceanside is one such area where the matter of unauthorized liveaboard tenants has become a burden. A source close to the situation states that it’s incredibly difficult to prove a tenant is illegally living aboard the vessel and that Oceanside Harbor, a city-run harbor, is working towards a solution to this problem. One of the major issues drawing sneakaboards into a marina or harbor: Its size and points of entry. “In smaller marinas where dock access is through a central point, enforcement would be easy. For larger facilities with many access points, enforcement is more complicated and time-consuming,” Whitlock said. For Whitlock, the key to combating unauthorized liveaboard tenants is in consistent enforcement. “Consistent enforcement is the key to keeping unauthorized liveaboards at a manageable level. As I’m fond of saying, you need to address issues as they come up because you will have 10 more issues tomorrow,” he said. In California, waterfront or on-water property is at a premium. How can regulations toward liveaboards be implemented to allow for the best for both tenants and harbor operators? Have any marina tenants out there been affected by sneakaboards for the worse? As some one who has liveaboard, both as a sneakaboard and now as some one who holds a liveaboard permit for my vessel, I can tell you that the main issue is not the sneakaboards who try want to pay for the services that they are using, but the derelict people that buy floating piles of garbage from harbor masters and then further trash the boats, docks and surrounding areas. This article does a poor job at explaining the situation. Harbor masters will keep boats that have been totaled in their marinas and sell them to derelicts to bring up their bottom line. Imagine if a car lot kept a bunch of rotting totaled cars that can’t move instead of paying to have them cleared out of the lot, and instead sold them to street bums; it seems pretty obvious that would increase the crime in the lot and you’d have a bunch of bums sprawled out on top of the vehicles. There is extremely little oversight into how harbor masters run marinas. And basically no say from the public or the boat owners into how things should be run. What a bunch of crap who came up with this? It does not surprise me though only in California do you constantly have people interfering and criminalizing otherwise law abiding citizens. To refer to someone as a sneakaboard who has paid and exorbitant amount for their vessel, plus insurance, and ridiculous slip fees, along with state and county property taxes is the most insulting and completely ridiculous accusation or attempt I have ever heard and to compare them to squatters is absolutely insane. I have lived on my vessel for over 20 years in Southern California, a 750,000.00 vessel, and pay over 2000.00 a year in property taxes and for what? The slip fees are completely out of line with the rest of the U.S and the facilities for the most part are sub-par. The City Does absolutley nothing to promote or encourage boating in comparison to many, many, other states and communities. Perhaps the marinas, local and state governments should take a look at them selves and their services or lack of before making stupid claims and titles to people who have worked hard and deserve a fair opportunity to live the way they choose. You are a well informed smart person who see’s through these mental people.. I agree with you.. Live and let live.. Whats the problem? This article needs major work.